Business leaders are being continuously advised to "prepare for Brexit". But how do you prepare with no rule book or end game? That is now changing to some extent. 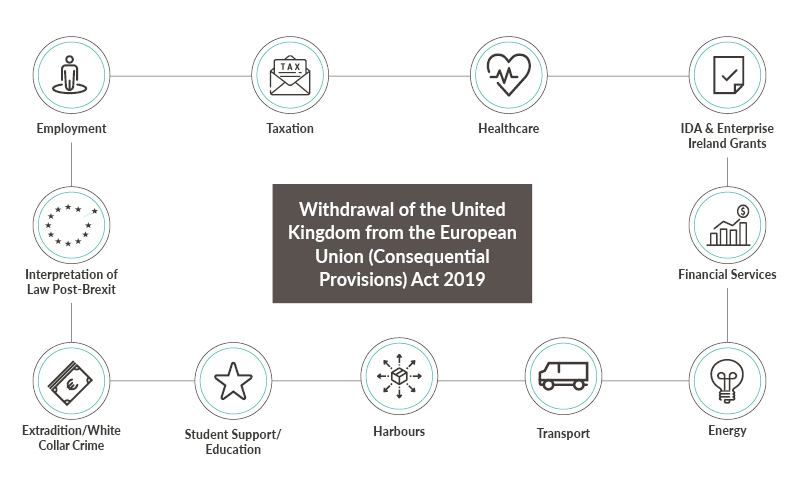 Ireland has now enacted the Withdrawal of the United Kingdom from the European Union (Consequential Provisions) Act 2019. This act was adopted in a swift and smooth process in the Irish parliament (the Oireachtas) and has been signed into law by the Irish President. When it will enter into force depends on when and how (i.e. with or without an agreement) the UK leaves the EU. Lawyers from all our offices are providing updates on the key elements and implications of entire Brexit process and hope this update helps you in your Brexit planning. Read our full analysis which gives you valuable insight into the Irish Brexit Rulebook and how it could affect your business. Below we have created separated guides in relation to a number of topics that are affected by the legislation. Read our summary of the Act and how it relates to Social Welfare here or contact Michael Doyle, Employment partner. For more information on how the Act protects employees click here or contact Noeleen Meehan, Employment Associate. To read our summary on the Acts impact on immigration click here or contact Duncan Inverarity, Head of Employment. For more information on how the Act affects taxation click here or contact James Somerville, Tax partner. For more information on this topic click here or contact Sheena Doggett, Corporate and M&A partner. For more information on how the Act impacts Irish financial services infrastructure click here or contact Seamus O'Croinin, Finance partner. Read our summary of how the Act relates to insurance here or contact Laura Mulleady, Insurance partner. For more information on this topic click here or contact Cliona Christle, Healthcare partner or Anna-Marie Curran, Procurement partner. For more information on how the Act impacts current Energy landscape click here or contact Ross Moore, Energy & Natural Resources partner. For more information on the authorisation of 'third country bus services' click here or contact Eamonn Conlon, A&L Goodbody partner. For more information in relation to student support and education matters under the new Act click here or contact Eamonn Conlon, A&L Goodbody partner. For more information about how shipping and ports are affected under the new Act click here or contact Dr. Vincent Power, EU, Competition and Procurement partner. For an update on how the Act affects extradition processes in relation to White Collar Crime click here or contact Kenan Furlong, White Collar Crime partner. For a sumary of the interperation of the Irish legislation post-Brexit contained in the Act click here or contact Dr. Vincent Power, EU, Competition and Procurement partner.